The dog leash is a shock absorber and creates a cushion from any sudden moves made by you or your dog. As you encounter your dogs pull, the Bun-Gee Pup-EE leash stretches and the resistance your pet experiences teaches them not to tug anymore, helping you to train your dog! A GREAT Restraint System! Even if your dog doesn't play tug-a-war, it still looks terrific and functions perfectly. Your dogs weight determines which size you need. 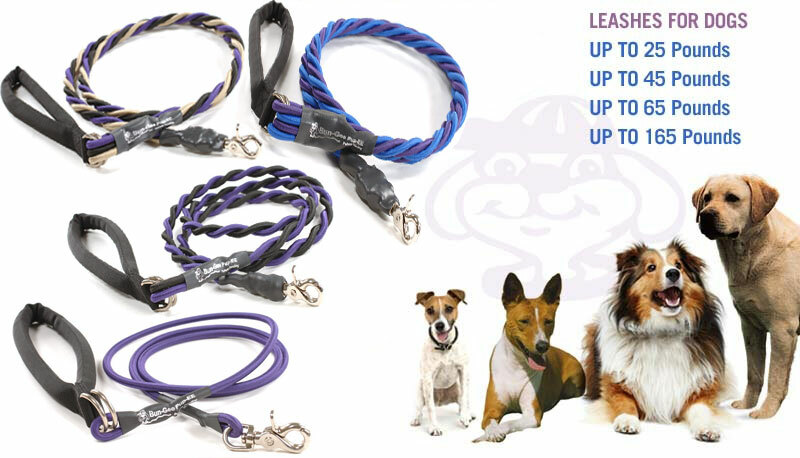 Find bungee dog leashes for up to 25 pounds for small dogs or dog leashes up to 45 pounds for your mid-size dog. Medium size dogs require an expandable dog leash up to 65 pounds and your very large strong dogs will love the dog lead up to 165 pounds. Read more to find the right dog leash for your pup. Try the Bun-Gee Pup-EE Today and see why dog trainers call it; The first step training tool. Small dogs love BunGee PupEE when they walk on their dog leashes because the pressure is relived from their back, neck, and shoulders. When choosing the right leash for your small dog, make sure your dog is at least 10 pounds due to the weight of the hook. If your dog is almost 25 pounds and pulls on your standard dog leash, to the point of choking, you will need the next size larger or the up to 45 pound leash! Medium dogs love BunGee PupEE when they walk on their leash because the pressure is relived from their back, neck, and shoulders. When choosing the right leash for your medium dog, make sure you select the right size leash for you. If your dog is almost 45 pounds and pulls a lot on your standard dog leash you will need the next size larger or the 65 pound leash! If your dog is strong and not easy to walk with, this is the leash for you! Our most popular leash that is Great for any sudden moves. Twisted to perfection for a fashionable and functional leash that's a sure win with your Favorite Pup Friend! Dogs up to 65 pounds love BunGee PupEE when they walk on their leash because the pressure is relived from their back, neck, and shoulders. When choosing the right leash for your dog, make sure you select the right size leash for you. If your dog is almost 65 pounds and pulls a lot on your standard dog leash you will need the next size larger or the 165 pound leash! Don't let your dog walk you, Use a Bun-Gee Pup-EE Expandable Dog Leash that's made for your really strong dog. A Great Shock Absorber that has helped many walk their dog instead of struggling to have fun during walks with their favorite pet! Dogs up to 165 pounds really love BunGee PupEE when they walk on their leash because the pressure is relived from their back, neck, and shoulders. (I've heard YOU will really like it too!) When choosing the right leash for your dog, make sure you select the right size leash for your dog. If your dog is close to or over 65 pounds and pulls a lot on your standard dog leash, we recommend the three foot length in the 165 pound leash size!